Delaware is known as “The First State” as it was the first state to ratify the constitution of the United States. The population is nearly 950,000 which may not sound like a lot compared to other states, but it has population density of 469 people per square mile. Compare that to Texas which has 28 million but a density of 103 people per square mile. Delaware is also known for being the best state to incorporate in, with over 50% of publicly traded companies incorporated in the state due to its laxed corporate law. Delaware has the 9th largest amount of millionaires per capita, and low unemployment rate of 5.1%. As far as safety goes, Delaware has several cities that rank favorably on our scale. 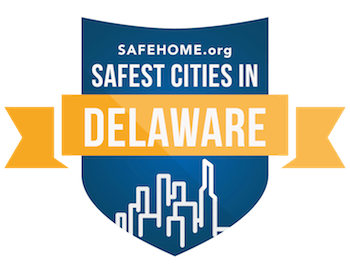 While Delaware may only have 1 city that ranks on our national list of the safest cities, it has several smaller cities that have high safety scores above 80. The safest city in Delaware is Ocean View with a safety rating of 92.22, and about another dozen cities with rating above 75. A majority of the cities that ranked in the top 25 safest cities have been experiencing a decline in frequency of property crimes. Ocean View has seen a decline of -15.9% in property crimes, and zero incidences of robberies. The town has grown by 87.1% over the past 10 years. Currently the population is at 2,035 with a median income of $47,500 per household. It is primarily a commuter town, where most of the residents work in another town. This is the primary reason for the high safety rating of Ocean View, as it is mainly family oriented. Elsewhere in Delaware are several other very safe cities like Bridgeville, Middletown, and Georgetown. There isn’t any place in Delaware that has a high concentration of safe cities like in some other states. There are great, safe towns sprinkled throughout all of Delaware.